The Sultan Seif al-Dawla al-Hamadani built the first fortress on the hill and used it as his military headquarters. It was later further fortified but captured in 1117 and 1128. Saladin’s son, Ghazi, rebuilt it between 1193 and 1215 . 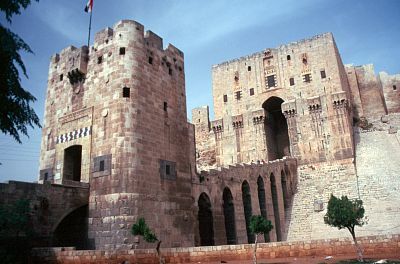 The present structure of the Aleppo citadel is Ghazi's work. The Citadel has an elliptical base with a length of 450m and width of 325m, at the top this ellipse measures 285m by 160m with the height of this slanting foundation measuring 50m. It became a UNESCO World Heritage Site in 1986 and in 2000 a major restoration project was started. The tower walls were strengthened and preserved and missing stones in walls and arches were replaced.